Adoption makes me cry. Always. I was never really a cryer until adoption and I met face to face. In fact, right now, while I write this, I've just been reading some blog posts from a girl I've never met in person, but we've gone back and forth on e-mail about her adoption journey--the good stuff and the really, really hard stuff-once she found my blog. Her baby girl is due soon, she's actually over-due, and when I read what she writes about this journey and how it's been for her and her husband so far and where she is now and I see pictures of her baby things all packed and ready to go once she gets a call from the hospital, I can't stop crying......big huge happy tears for her. And I cry for the birth parents and how amazing their decision is. How selfless and unconditional and mature and loving--for their child--their decision is. I cry because I will never forget every single detail of the day we took Georgia home from the hospital and how gut-wrenching that was. Feeling so ecstatic about the fact that I finally had a child, but feeling like I was kidnapping someone's baby at the same time; even though they were hugging us and crying with us and telling us they'd be okay, "we'll see you later." There are so many emotions woven together to make adoption--emotions that you don't always think coincide and can live in harmony--but they do......in this crazy beautiful way. There has been no single event in my life that has changed me more, made me better, made my marriage stronger, made me love people more, made me realize how specifically God writes our stories before we even know there's a story, made me realize how wrong I can be sometimes, and made me more passionate than adoption and my daughter, and her birth families. Not one. So today, my message is simple. If you know someone who has been touched by adoption because they've been adopted, they're adoptive parents, adoptive grand-parents, they work in the adoption field, or they are everyday heroes--they're birth parents and birth grandparents, wish them a happy "National Adoption Day." It's such an important day. Such a good day. 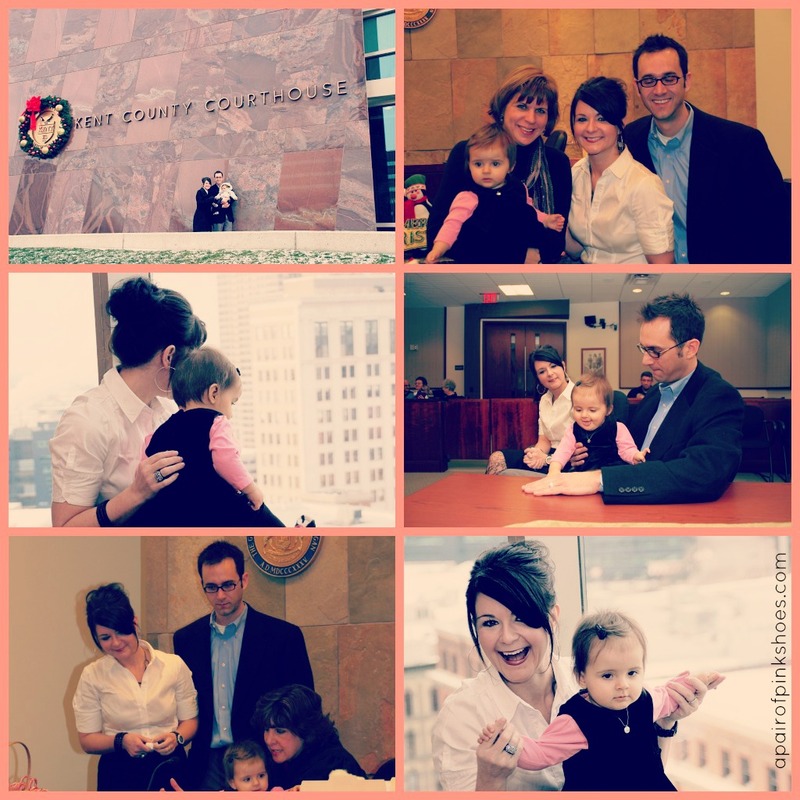 Here's a few shots from our adoption finalization hearing back in December of 2009. We're approaching the third anniversary of Georgia's adoption day and we can't wait to celebrate it! Check out what we did last year if you'd like. I had to go back and re-read what you guys did last year. I love her commentary on the horse ride and the significance of the ornaments too. What are you guys planning on doing this year?